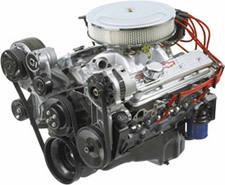 You won’t go broke finishing off your project car with a GM Performance Parts 350 HO Turn-Key crate engine! It’s packed with all the features you need to get a reliable 330 horsepower and 380 lb.-ft. of torque from a dependable, time-tested combination of GM Performance Parts. Of course, all of the GM Performance components used in this engine are brand new—not remanufactured parts like the competition is trying to sell you. Designed by our in-house engineers to give you maximum return for your hot rod dollar, the GM Performance 350 HO Turn-Key is a great choice for your small-block crate engine needs.